Ferrie Bodde has told former club Swansea City he is "just happy to be alive" as he thanked club and fans for their support while he was in an induced coma to combat pneumonia. Fans showed their support as Swansea beat Aston Villa last weekend. The 31-year-old told the club's official website: "I'm just happy to be alive at the moment. It's been tough. "But the support I've had has made me fight like a lion. No, that's wrong, more like fight like a Swan." 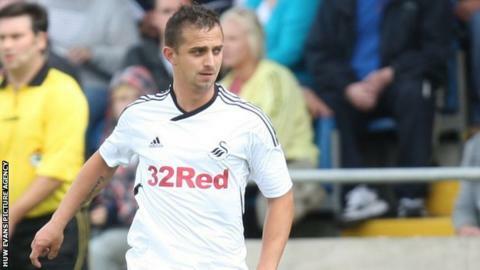 Ex-midfielder Bodde wore number six at Liberty Stadium during a stint peppered by injury. And six minutes into their 2-1 win over Villa, the club's electronic scoreboard bore Bodde's name and the legend "Once A Jack, Always A Jack". Fans reacted with a minute's applause and chants of Dutchman Bodde's name, which he watched from his hospital bed in the Netherlands. "The club, players and supporters mean so much to me," Bodde said. "What they did during the game was unbelievable and I will be eternally grateful. "The support has been amazing and I just wish I could thank everyone personally, but I know that's impossible." He added: "I was awake on Saturday during the game, but if I'm honest I wasn't really with it. "But I saw all the footage on the Sunday and it was really emotional. I had goose bumps everywhere. Bodde is head coach of Dutch amateur club SV Wateringse Veld after being forced into retirement by injuries. He joined the Swans under then-manager Roberto Martinez in June 2007 from Den Haag for an initial £50,000, and left in July 2012 after suffering three cruciate knee ligament injuries during his time at Liberty Stadium.